Speaking at the occasion, Shri Nadda stated that AIIMS is a pioneering and unique Institute that maintains a fine balance between quantity and quality. The Health Minister assured that the Government is committed to ensuring that the new AIIMS will meet the same standards of service as AIIMS, New Delhi.No effort will be spared to make them the very best, he added. Shri Nadda stated that AIIMS has created a benchmark in the field of healthcare not only at the national level but internationally also. It has a great testimony and we must try to replicate it in the new AIIMS, he added. He noted that the new Institutes will have the same culture as AIIMS, New Delhi. “Innovation for cost-effective and affordable health care is the need of the day. To take up all these challenges AIIMS needs strengthening and expansion of its facilities. 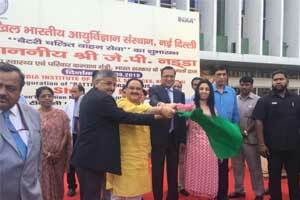 Which we are committed to providing,” Shri Nadda said. Shri Nadda further stated that under the able leadership of Hon’ble Prime Minister Shri Narendra Modi Ji, the Health Ministry is committed to providing the best and highest quality health care services to the people of the country. He said that Ayushman Bharat – Pradhan Mantri Jan ArogyaYojana (AB-PMJAY) is a big leap forward in Universal Health Coverage, which will cover 10.74 crore poor and vulnerable families, which effectively means more than 55 crore beneficiaries. He further said that the scheme will provide secondary and tertiary care hospitalization and will be paperless and cashless. The services will include more than 1,350 procedures covering pre and post hospitalisation, diagnostics, medicines etc. 10 Battery operated buses were donated by INDIA TV as part of their CSR (Corporate Social Responsibility ) initiative to AIIMS. Maintenance of these 10 buses including the salary of the Drivers and other support staff for two years will be entirely borne by INDIA TV and the same can be renewed further. These buses will be used for intramural campus transport of visiting Patients, Patients attendants and also for the staff working at AIIMS. Every day around 5,000 passengers can be commuted internally through this newly added buses fleet. AIIMS, New Delhi formulated its CSR Policy in 2017. Three CSR subcommittees has been constituted: Research committee, Infrastructure committee and patient care for monitoring & effective utilization of funds received under CSR. Shri Rajat Sharma, Chairman India TV, Prof. Randeep Guleria, Director AIIMS New Delhi, Ms Ritu Dhawan, Managing Director & CEO, INDIA TV and Prof. O.P. Kharbanda, Chairman, AIIMS CSR Committee were also present at the inauguration function. Later, Union Health Minister presided over the MoU exchange ceremony between AIIMS, New Delhi and INDIA TV. AIIMS is not just about good infrastructure and heavy funding.Its about dedicated and highly qualified doctors.The later part is lacking in new AIIMS.Most of the faculties in new AIIMS are lethargic with poor academic background. For all we know it will be equally bad. See the mess with the newer IITs.